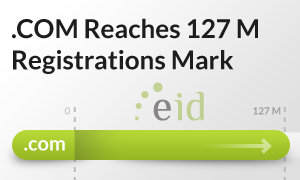 The total number of registrations in the .COM base has surpassed 127 million. The .COM Registry’s website shows that the number of registered names in the .COM domain base has exceeded 127 million for the first time on record. The .COM domain base includes the active domains, names that have the “hold” status, and domain names that have not yet been configured for active use. The world’s top domain continues to grow and does not cease to attract registrants on the primary as well as secondary market. According to the Registry, at the time of writing this, there are 127,244,984 registered names in the .COM extension. At the same time, the second largest generic domain – .NET – has 15,803,886 registered names in its base. Both .COM and .NET have been offered for registration for over 15 years. They are regarded as the most trusted and reliable domains. Many brands and businesses worldwide have been very successful in taking their business online thanks to .COM or .NET extension. If you desire to join the .COM or .NET community, register your own domain name and enjoy the recognition and trust that it will offer. The process is easy and quick thanks to our search tool that helps you check the name’s availability. If you need assistance, please do not hesitate to contact us at support@europeid.com.